As a Reference Archivist and librarian, it is always exciting to discover a new family history web site, database, or print publication that can assist me in my personal research or professional work. It is particularly thrilling, then, when that new database is actually released from my place of employment. 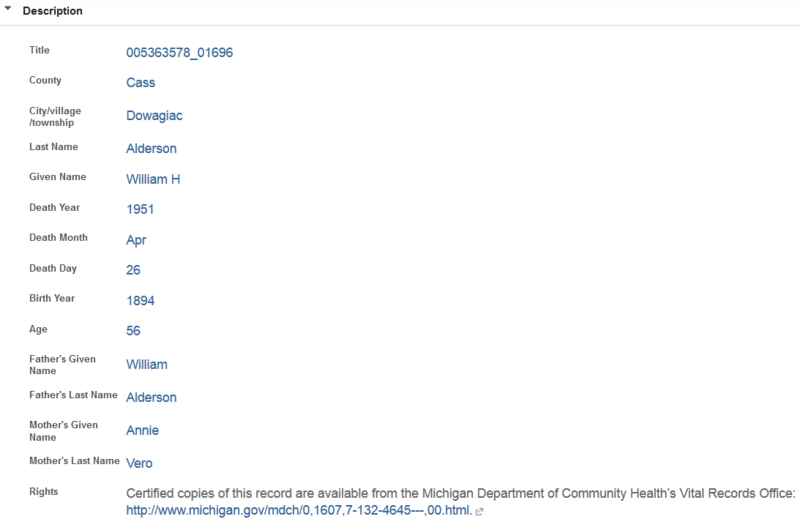 Just last month, the Archives of Michigan released the next set of Michigan death records at Seeking Michigan. 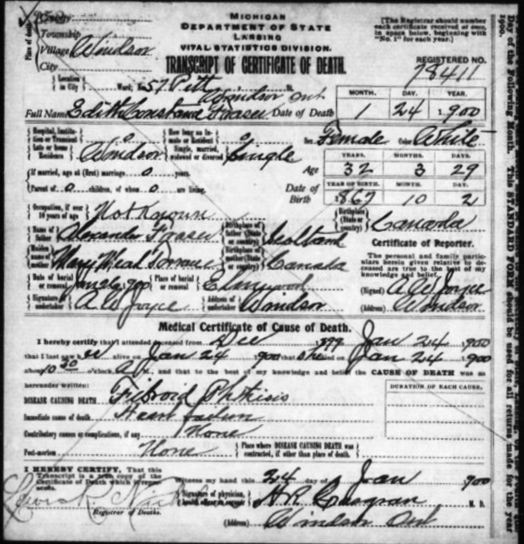 Covering 1921-1952 and including more than 1.6 million records, the actual death certificates from 1921-1939 are now freely available, with index-only data from 1940-1952. The 1921-1952 index data has been available at FamilySearch for some time, but the certificates themselves are only available at Seeking Michigan. Additional certificate images will be released each year at Seeking Michigan as privacy restrictions are lifted; for example, 1940 images will be released in January 2016, 1941 in January 2017, and so on. Together with the records from 1897-1920 that have been available at the site for years, this new collection of free death records makes Seeking Michigan the one-stop destination for more than 2.6 million death records for Michigan genealogical and historical research. William Alderson in “Death Records, 1948-1952.” Seeking Michigan: http://seekingmichigan.org. Accessed 30 April 2015. Although I’ll have to wait until 2027 to see the death certificate online (! ), I could in the meantime pay the small exorbitant fee to get a copy from the state or county. Regardless, my family can be found online alongside master illusionists, auto magnates, and a “deliciously different” beverage pioneer. With a full slate of programs this week, including stops across Michigan in South Lyon, Charlotte, Davisburg, and Boyne City, I have a number of opportunities to reach out to and interact with library patrons, family history researchers, local societies, and their members. This busy week comes at a most opportune time. With the transfer of the Abrams Foundation Historical Collection to the Archives of Michigan nearly complete, the time has arrived to promote the terrific collection and the many outstanding resources still available to family history researchers. After a quick check-in at the front desk, researchers will find family histories (Michigan, too), passenger list resources, military indexes, city directories, getting-started handbooks and manuals, and local history and genealogy resources for dozens of states. States of particular strength include those with strong ties to Michigan and it’s early migration patterns: the New England region, New York, Pennsylvania, Ohio, Indiana, Illinois, and the Canadian provinces of Ontario and Quebec. All of these resources fit seamlessly with the Archives’ already existing foundational collection of Michigan state, county, and local histories. 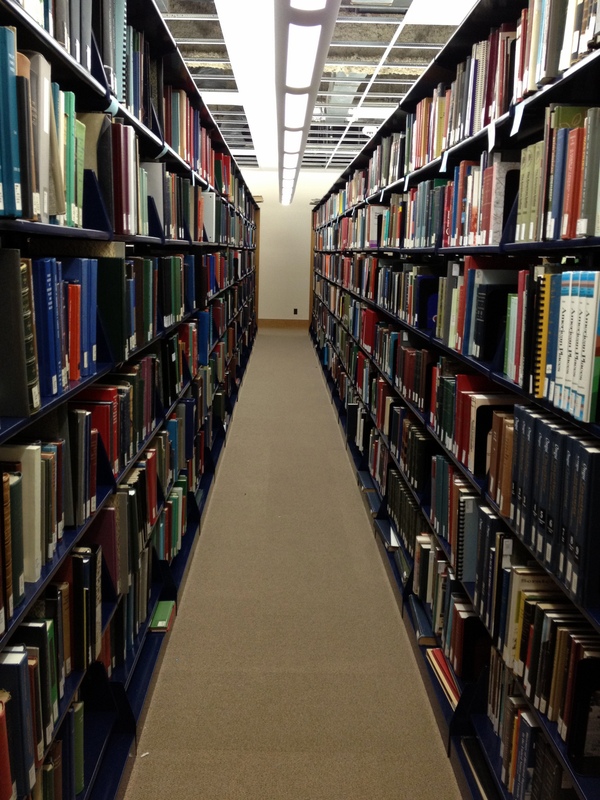 Researchers may wish to begin by browsing ANSWER, the online catalog. Please note that the locations in the catalog are still being updated to reflect the Archives’ new holdings. In the interim, researchers are encouraged to contact the Archives staff, who will be happy to assist you in finding the source of interest. The print resources that have moved over to the Archives are a complement to the already-outstanding collection of manuscript source material for Michigan, including such genealogically rich records as naturalizations, rural property inventories, state prison registers, county court case files, tax assessments, and Michigan vital records. The digital platform for the Archives can be found at Seeking Michigan. Including Michigan state census records (in-process), Michigan Civil War regimental records, death records (from the Library of Michigan) covering 1897-1920, and naturalization indexes for more than 30 counties, this online destination for Michigan research will continue to grow. Visitor information, including contact numbers, street address, and open hours, can also be found here, at the “Visit Us” link under the Seek tab. This collection transfer to the Archives of Michigan would not have been possible without the continued support of the Abrams Foundation, the Michigan Genealogical Council, the Records Preservation & Access Committee, and the management team of the Michigan Historical Center. Researchers with roots in the Great Lakes State and beyond owe a great debt of gratitude to these forward-thinking organizations. With the uncertainty of the last few years now behind us, this is an exciting time for family history research in Michigan. Archives staff will be working hard to make this transition as seamless as possible, and we encourage researchers to stop by, take a look around, and perhaps discover something new. We look forward to assisting you in your family history journey, whether it takes you to Michigan, the Great Lakes region, or beyond. And perhaps I’ll see you this week on the road!